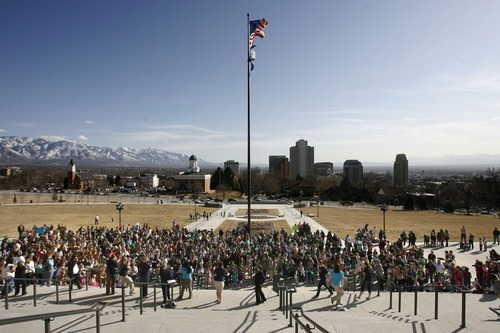 Rick Egan | The Salt Lake Tribune More than 1,500 Girl Scouts, their families, friends, showed up at the Capitol to celebrate the Girl Scouts' history by singing songs, performing a "flash mob," and enjoying Girl Scout birthday cupcakesand celebrate March 12th as Girl Scout day in Utah, Monday, March 12, 2012. Rick Egan | The Salt Lake Tribune More than 1,500 Girl Scouts, their families, friends, showed up at the Capitol to celebrate the Girl Scouts' history by singing songs, performing a "flash mob," and enjoying Girl Scout birthday cupcakesand celebrate March 12th as Girl Scout day in Utah, Monday, March 12, 2012. 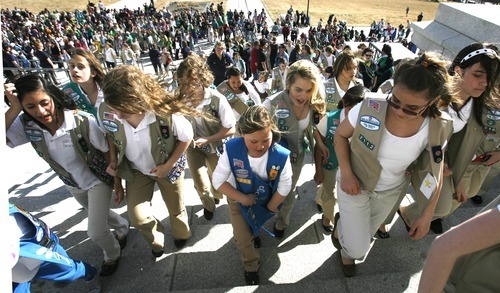 Rick Egan | The Salt Lake Tribune More than 1,500 Girl Scouts, their families, friends, showed up at the Capitol to celebrate the Girl Scouts' history by singing songs, performing a "flash mob," and enjoying Girl Scout birthday cupcakesand celebrate March 12th as Girl Scout day in Utah, Monday, March 12, 2012. 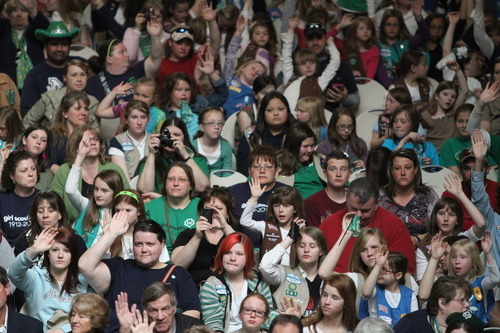 Rick Egan | The Salt Lake Tribune More than 1,500 Girl Scouts, their families, friends, showed up at the Capitol to celebrate the Girl Scouts' history by singing songs, performing a "flash mob," and enjoying Girl Scout birthday cupcakesand celebrate March 12th as Girl Scout day in Utah, Monday, March 12, 2012. Rick Egan | The Salt Lake Tribune More than 1,500 Girl Scouts, their families, friends, showed up at the Capitol to celebrate the Girl Scouts' history by singing songs, performing a "flash mob," and enjoying Girl Scout birthday cupcakesand celebrate March 12th as Girl Scout day in Utah, Monday, March 12, 2012. Rick Egan | The Salt Lake Tribune More than 1,500 Girl Scouts, their families, friends, showed up at the Capitol to celebrate the Girl Scouts' history by singing songs, performing a "flash mob," and enjoying Girl Scout birthday cupcakesand celebrate March 12th as Girl Scout day in Utah, Monday, March 12, 2012. Rick Egan | The Salt Lake Tribune More than 1,500 Girl Scouts, their families, friends, showed up at the Capitol to celebrate the Girl Scouts' history by singing songs, performing a "flash mob," and enjoying Girl Scout birthday cupcakesand celebrate March 12th as Girl Scout day in Utah, Monday, March 12, 2012. Rick Egan | The Salt Lake Tribune More than 1,500 Girl Scouts, their families, friends, showed up at the Capitol to celebrate the Girl Scouts' history by singing songs, performing a "flash mob," and enjoying Girl Scout birthday cupcakesand celebrate March 12th as Girl Scout day in Utah, Monday, March 12, 2012. 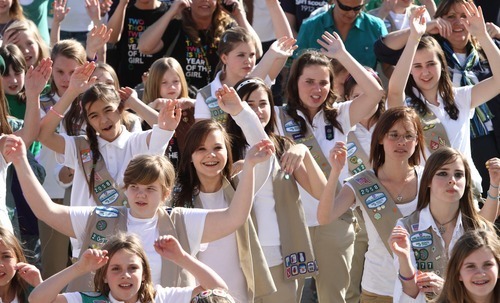 Rick Egan | The Salt Lake Tribune Brianna Cooley, Fruit Heights, (center) and Taya Unruh, Woods Cross, (right) joined more than 1,500 Girl Scouts, their families, friends, showed up at the Capitol to celebrate the Girl Scouts' history by singing songs, performing a "flash mob," and enjoying Girl Scout birthday cupcakesand celebrate March 12th as Girl Scout day in Utah, Monday, March 12, 2012. Rick Egan | The Salt Lake Tribune More than 1,500 Girl Scouts, their families, friends, showed up at the Capitol to celebrate the Girl Scouts' history by singing songs, performing a "flash mob," and enjoying Girl Scout birthday cupcakesand celebrate March 12th as Girl Scout day in Utah, Monday, March 12, 2012. 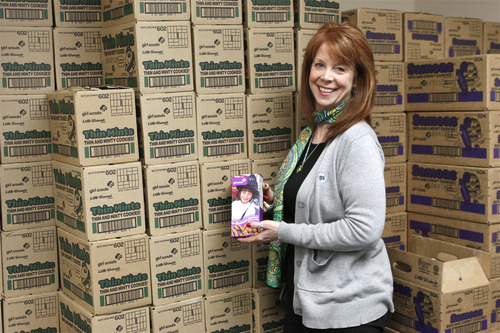 Courtesy of Annie Cutler CEO Cathleen Sparrow of the Girl Scouts of Utah, with a few of the thousands of boxes of cookies that girls are selling this year. 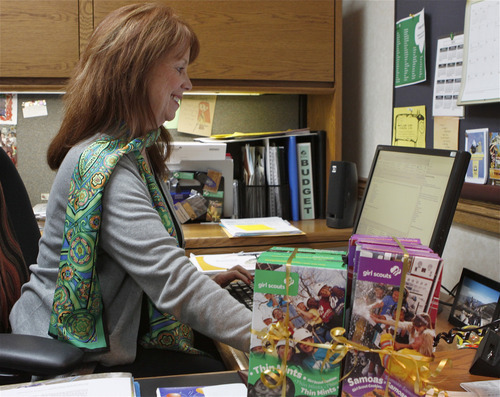 Courtesy of Annie Cutler Cathleen Sparrow, CEO of the Girl Scouts of Utah, is working to increase the group's membership. 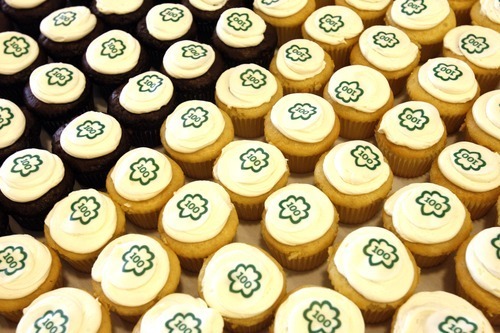 Courtesy of Annie Cutler Cathleen Sparrow, CEO of the Girl Scouts of Utah, at the group's Murray headquarters. 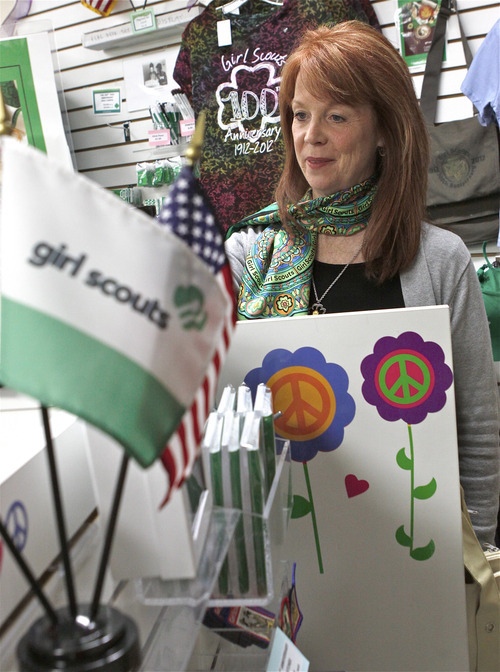 Courtesy of Annie Cutler CEO Cathleen Sparrow in the Girl Scouts of Utah's store at 445 E. 4500 South. 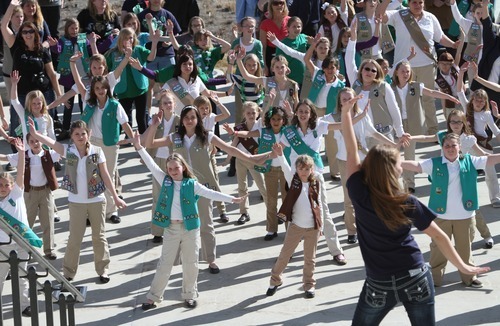 Rick Egan | The Salt Lake Tribune Savana Wallace, Layton, joins more than 1,500 Girl Scouts, at the Capitol to celebrate the Girl Scouts' history by singing songs, performing a "flash mob," and enjoying Girl Scout birthday cup cakes and celebrate March 12th as Girl Scout day in Utah, Monday, March 12, 2012. 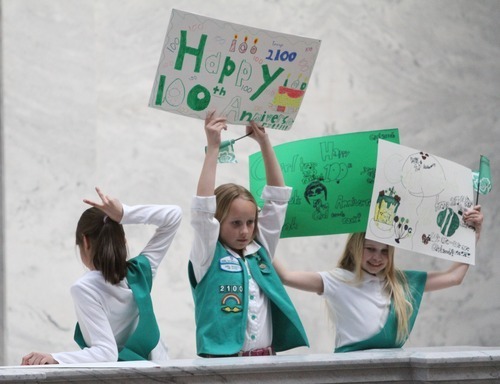 Thousands of Girl Scouts gathered with friends and families at the Capitol on Monday afternoon to celebrate the 100th anniversary of the organization. 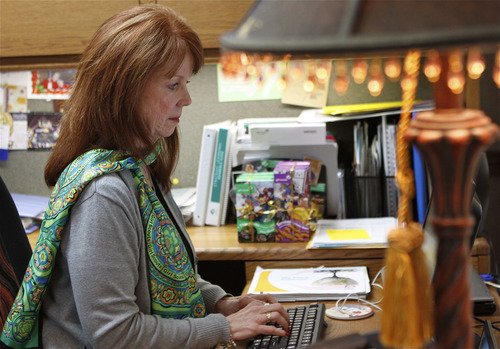 As many as 3,000 were expected to attend the two-hour event. Gov. 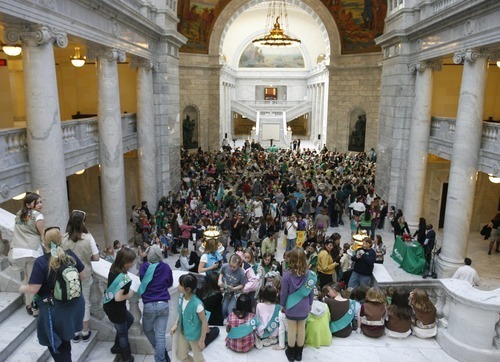 Gary Herbert proclaimed Monday as Girl Scout day. 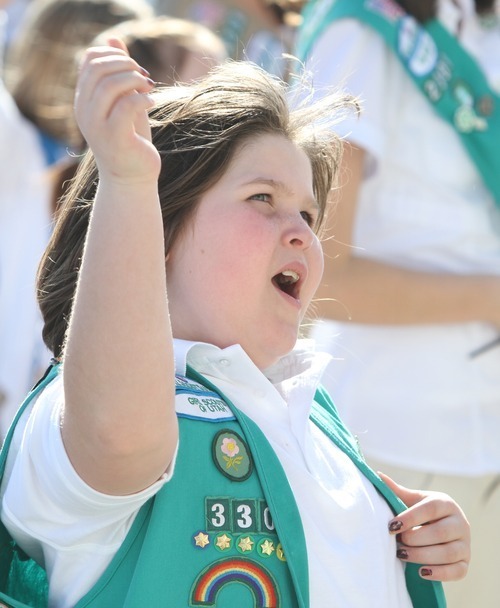 As you would expect at such a gathering, the celebration included sing-alongs, a flag-raising and the recitation of the Girl Scout Promise. 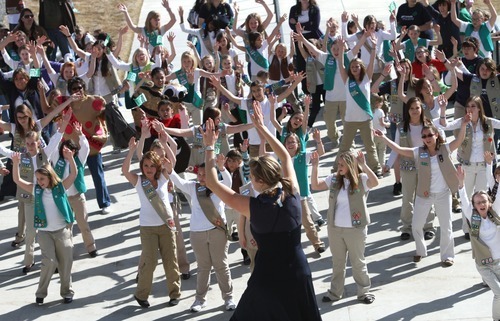 There are 3.2 million Girl Scouts, and more than 9,500 in Utah.